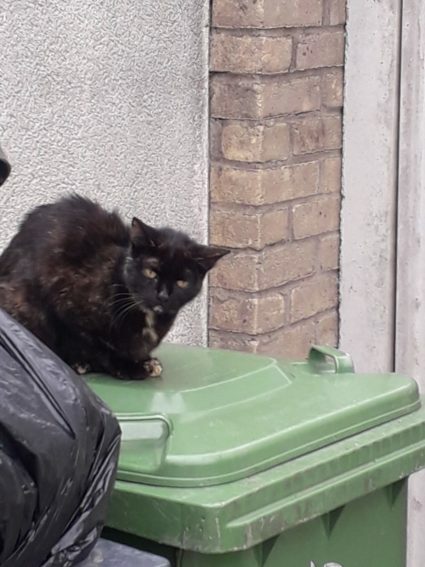 Cat Found Homeless In Chapel Farm, Lusk. This cat has been hanging around the Chapel Farm area in Lusk for the last few weeks. This poor thing is wandering around. I think people are feeding her and giving her water but she definitely looks like she needs some TLC. She’s black with patches of brown fur (we actually thought it was dirt but it’s her fur). I have no other details, I just wanted to post it up in case someone has been looking for her (I was told it’s a girl). Phone 085 149 4448 to enquire.